Led Ashtanga is much more than a "good workout"
At Balance Yoga, we're committed to teaching Ashtanga yoga in a safe and intelligent manner. We pay special attention to anatomical alignment so that you're always safe. 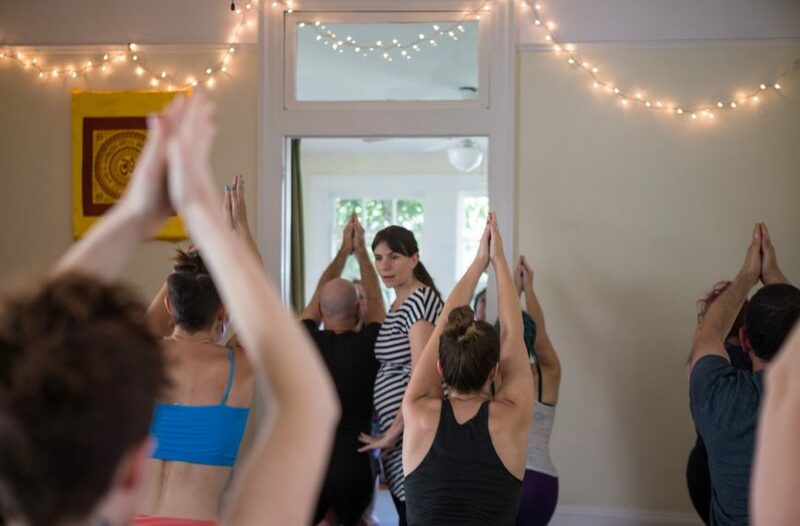 We honor the internal forms of the practice: steady breathing (ujayii), and connecting to your core (bandhas), and focal points (drishti), so that you're practice is more than a "good workout." To keep you safe and facilitate an optimal yoga experience, we've developed three levels of Led Ashtanga. In Led Ashtanga class the teacher leads the you through a part (or all) of the primary series of yoga postures— attentively and with focus. You're encouraged to become mindful of your breath as you move through the postures of the series. If you're new to yoga, we recommend you start with our Introduction to Yoga Program or the Intro to Yoga: Vinyasa & Ashtanga class. You're guided through sun salutations and standing postures at a steady pace. We assume that you're somewhat familiar with the beginning of the primary series. This is not a class for complete beginners to the Ashtanga Program. The teacher will spend time introducing the first postures of the seated sequence: forward bends and hip openers up to Janu Sirsasana. The class will finish with basic backbends, and the last three seated finishing postures. In Led Ashtnaga 2, we'll move through the sun salutations and standing postures at a fluid pace. We'll spend time introducing the postures between Janu Sirsasana (head-to-knee) and Navasana (boat pose). This is considered to be "half primary" series, although it's more like 3/4 of primary series. In this class we'll introduce the shoulder stand and finishing sequence, including headstand. This requires strong and open shoulders. We'll offer modifications for all the postures. In Led Ashtanga 3, we guide you through all the postures in the ashtanga primary series, or we incorporate a mix of postures from the second and third series. The goal of this class is to introduce regular Ashtanga students to advanced concepts that may not be covered in other Ashtanga classes. This is not a class for students new to the Ashtanga method. Examples of topics we explore are backbends and dropping back from standing, handstands and arm balancing, twists, deep hip openers.